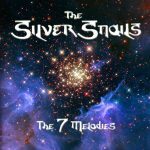 The Silver Snails have a video for their song "Ave Maria A Zio Virgilio," and it's now available via Vents. The site explains that the band's "uncompromising, hands-on approach to quality and craftsmanship resonates across their media and branding. An Italo-US joint venture between lead singer Lucas Ward and his wife Elisa Fantini, The Silver Snails take inspiration from the family’s rustic backdrop in the wine country of Romagna, Italy, yet fashion a contemporary, artisanal pop-rock for a global audience, like a fine silk tie from a Florentine fashion house." See the video right here. The song comes from the band's new LP The 7 Melodies, which is going for NACC debuts next week.